The six-foot long table is scratched and dented, cup rings scattered around its top, as well of blobs of ink in the open drawer. The legs of the table are solid but each of the four end in delicate flourishes as they meet the floor. 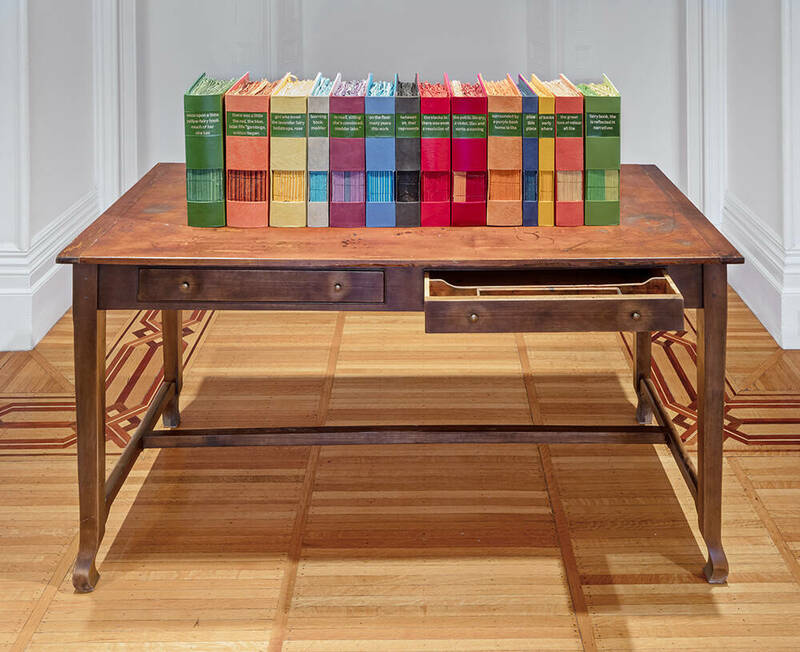 An exquisite array of coloured books are placed on this well-worn table (although, interestingly, this is a recently built table, made to Dhaliwal’s specifications by Phillip Murray). The books are bound with green leather plates with gold lettering. The narrative runs like the words on a page, from left to right requiring not just a shift of the viewer’s eye, but of her body, as well, in order to read the sentence that starts with “Once upon a time” and ends with “this work represents a resolution of sorts; a coming home to the place where all the narratives she has written began.” On moving around the back of the piece one sees the inside of each book—multi-hued paper that reflect the binding. The paper, purchased in Pondicherry, India, is handmade, its edges delicate and colour brilliant. The books are not uniform in size, and the interior of various books contains different hues of the same colour. Looking at the book from this angle, the coloured pages become animated, not unlike looking at musical notes on a staff. In the narrative that runs along the binding, Dhaliwal mentions fairy books: the green, yellow, red, blue, and lavender of her childhood. The reference is both to Andrew Lang’s 1889-1910 anthology of fairy tales and to her childhood. A variety of cultures and countries are represented in the hundreds of tales that Lang collected in uniformly published books with varying coloured bindings. It is not difficult to imagine Dhaliwal engrossed in such stories as King Kojata, The Enchanted Snake and Prince Fickle and Fair Helena. In the original The Green Fairy Book, the preface is titled “To The Friendly Reader.” Growing up in Southall, on the western edge of London in the mid-1950s, a young Sarindar Dhaliwal took stacks of these coloured fairy books home to read. Her memories of that time were of a disapproving mother caught between her native Indian and Western values. She felt that Dhaliwal read too much and that by doing so (ironically) would compromise her school studies. So this work, as much as it is about childhood memories of reading, is about a relationship between mother and daughter. While the girl grew in her love for stories and colour, her illiterate mother struggled with her identity. Dhaliwal recalls her saying “we don’t want to do this,” referring neither to herself or her daughter, but rather to the Sikh community. Where do the in-between truly belong? While the narrative and the illustrations found in Lang’s fairy books expanded Dhaliwal’s universe beyond western London and her Indian roots, colour has always fed her imagination. This seems appropriate when thinking about colour. As author Victoria Finlay notes: “colours… exist but only because our minds create them as an interpretation of vibrations that are happening around us.”  In her video piece olive, almond & mustard we see the grim reality of 1950s Southall, shot in black and white, a colourless, somber place. This makes the contrast with Dhaliwal’s work even more intense—the colour of her imagination more fully realized. the green fairy storybook is about Sarindar Dhalwal’s desire to read and love of colour. 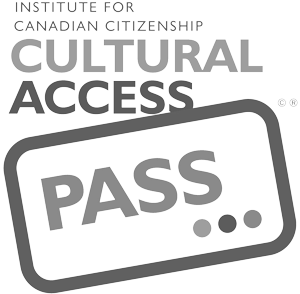 It is also about relationships, the immigrant experience and the development of an artist. Lecture by Sarindar Dhaliwal at the Chandigarh Lalit Kala Akademi Chandigarh, May 22, 2013. http://www.lalitkalachandigarh.com/videos.php?page=9, referrenced October 7, 2015. Victoria Finlay, Colour, London: Hodder and Stoughton, 2002, 4.